The O.S.S. II is the industry standard spinal immobilization/extraction device. It immobilizes the spine and head and can retract and immobilize the shoulders. It can also be used as a hip, leg or arm splint. Crossing shoulder straps hold the patient more securely than other devices, preventing movement without restricting breathing. All straps and buckles are color coded. Forehead restraint pads prevent slipping and are replaceable to prevent contamination with body fluids. use the head pads to provide occipital spacing and support. 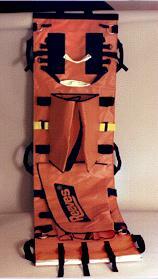 The shoulder board prevents lifting or compressing the shoulders when used in teh Sked or toher flexible stretchers. It folds into a small package that slips inside a Sked Stretcher in its back pack. Made of nylon/vinyl fabric and has webbing straps. The carrying case is made of orange cordura and has a pouch for accessories. Weight 7 lbs. (3.2 kg). Made in USA. The Miller Full Body Splint/Litter is a versatile spinal immobilization board and litter that comes complete with a full head and body harness. The body harness and head narness will adjust in size to accommodate anyone from a small child to a large adult. This harness system will allow anyh victim to be rotated onto their side for proper airway management or to effect a difficult extrication without jeopardizing a spinal position. Manufatured from a lightweight, highly visible yellow resin, the board is resistant to gasoline and many other chemicals and does not require refinishing. A rigid foam core provides strength and buoyancy for hazardous water rescues. The split leg design allows each leg to be treated separately. The Full Body Splint/Litter is also radiolucent allowing the victim to be X-rayed while still firmly attached to the board. Length: 65.8" (169 cm), Width: 14" (36 cm), Thickness: 3.3" (8.3 cm) at fullest point. Weight 15 lbs. (6.8 kg). Half Back extrication/rescue vest with removable backboard. The LSP Half Back is a versatile, lightweight and durable short body immobilization board designed for suspected cervical/spinal injuries duringconfined space extrication. 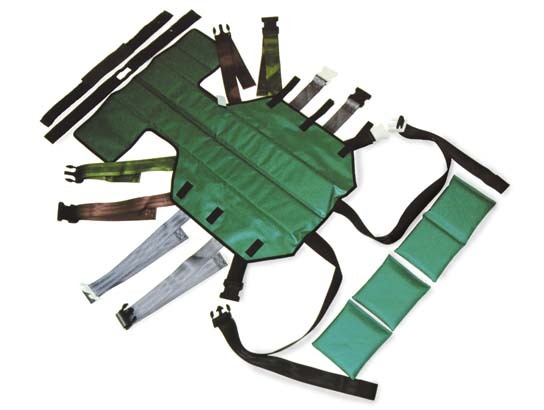 The Half Back comes complete with: a full head harness and an optional helmet harness for helmeted victims, six strategically located handles, quick release Velcro storage pockets that neatlyhouse all straps until needed, an aluminum back/stay anatomically designed for the cervical portion of the spinal column. The interior of the Half Back is a non-absorbent, closed-cell foam.The outer covering consists of a tough, stain-resistant, washable juinior ballistic nylon. Weight 7.5 lbs. (3.4 kg). The Reeves Sleeve provides faster, safer immobilization. 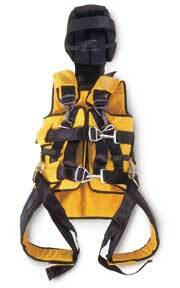 May be used with a four-person carry, in a vertical or horizontal lift extrication, or helicopter lift. Once it is slipped over a spineboard or scoop stretcher, it totally wraps the patient for transport. The Reeves Sleeve offers the patient complete immobilization, security and comfort, and environmental protection. The Reeves Sleeve offers the rescuer vertical/horizontal lift extrication, lightweight, compact design, helicopter hoist capability, six handles for easy carrying, and durability. Steel oxide coated rings are sewn into the innerside straps for total weight suspension of any patient in the device. Continuous nylon straps with 4000 lb. (1814kg) tested seat belt type strapping insure patient safety during all lifts and carries, and Fastex side-release buckles allow quick application. 18oz. rip-stop vinyl-coated orange nylon is compact, lightweight, easy to clean, is anti-fungal, and resistant to acid, alkali, and liquids. Complete with carrying case. Weight 14 lbs.(6.4kg). 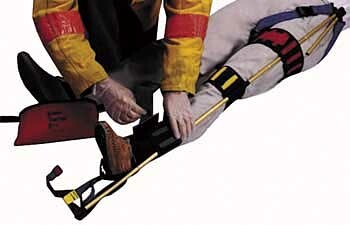 Henley Board Backboards A complete spinal immobilization device offering head/neck immobilization and changeable strapping system combined into one product. All boards are made of a fine 3/4"(1.9cm) 9-ply Birch plywood. A medium stain is applied and covered with 4 layers of finish coating and wax. Includes 72"(185cm) pinned backboard, head/neck immobilization device, wooden runners, under board grips[16"(41cm) model only], 3-pack ring snap strap set and accessories. Modifications to models may include tapered boards, pinned and unpinned, with or without S.I.D, with or without underboard hand grips, short boards, long boards, custom width and length boards, and mass casualty boards. 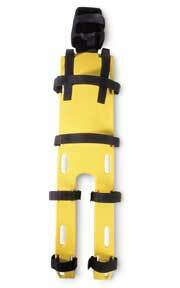 Short board spinal immobilization devices are also available. They are designed to be used in conjunction with the complete or modified models. Offers the same head/neck immobilization device as the long boards, yet offers the advantages of a short backboard. 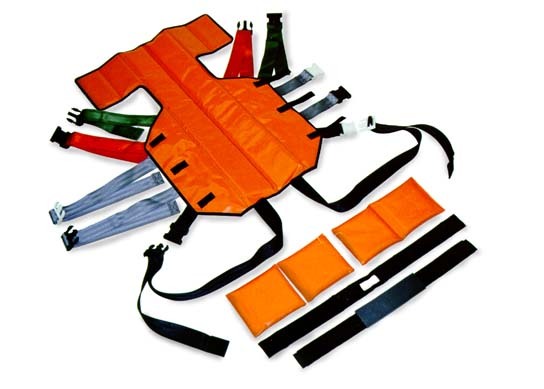 All parts are interchangeable with the long backboards, making it easier for training and use by all rescue personnel. Includes: 32"(82cm) pinned short backboard, head/neck immobilization device, 2-pack ring snap strap set and accessories. Short boards may also be modified. Call for descriptions and modifications. Made in USA. are standard equipment on full length and folding models. Two straps on the half length. Also available is folding lightweight aluminum model JSA-362-A. The industry standard for femoral traction. The Kendrick Traction Device (KTD) stores in a 9.5" x 3.5"(24x9cm) pouch and weighs under 20oz.(570g). The compact size allows the KTD to be easily stored in a trauma kit, first aid kit or backpack. The KTD mounts conveniently on the wall of an ambulance for ready access. The traction pole length quickly adjusts for adult or pediatric application. The need for patient roll-over or unnecessary leg raising has been eliminated. There is no ischial bar, so all problems of needless pressure are eliminated. Anti-shock pants can be quickly and easily applied over the KTD. The KTD comes complete with convenient storage pouch and easy-to-follow instructions. Colors: black or orange. The one splint with universal capability. So versatile, it can be formed to splint an arm, leg, or hand; it can also be trimmed to support a finger. Fold it, mold it, bend it, curve it, cut it, or shape it to the desired size. Only 4 1/4" x 36"(11 x 92cm) and weighing 4oz. 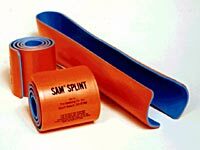 (114g), SAM Splint is strong, yet foam padded for comfort, and adaptable for any use. It is not effected by extremes of temperature or altitude, making it ideal in any terrain. SAM Splint is invisible on X-rays, waterproof, and reusable. It can be stored, rolled or folded. It can be doubled for increased strength. Rigid enough for use as an I.V. board. Color: orange/blue, or gray.